USADA announced today that U.S. swimming athlete Emily Brunemann (Ann Arbor, MI) has received a six-month suspension by an independent three-member arbitration panel from the American Arbitration Association (AAA)/North American Court of Arbitration for Sport (CAS). 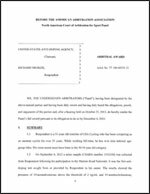 Brunemann, 22, tested positive on August 29, 2008 from a sample collected out-of-competition by USADA, for hydrochlorothiazide and triamterene. These substances are in the class of diuretics and other masking agents, and are prohibited under the USADA Protocol and the rules of the Fédération Internationale de Natation (FINA), both of which have adopted the World Anti-Doping Code and the World Anti-Doping Agency Prohibited List. Following a detailed evidentiary hearing, the AAA/CAS panel confirmed that Brunemann committed a doping violation and found that she failed to take appropriate steps to avoid ingesting a prohibited substance. The AAA/CAS panel suspended her for six months beginning on September 26, 2008, the day she received credit for serving a provisional suspension.